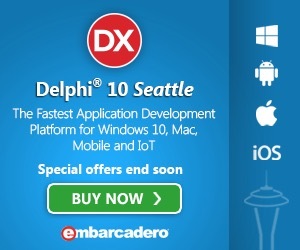 Delphi and C++Builder XE5 Update 1 is available as an MSI patch or an ISO. You can also download the update from the registered users web page. Where is that MenuItem displayed ? find what I needed. So I wrote it. Here is the result. window. I had everything I needed. my TForm1 class. I can’t? Not really. that declaration is located in the same source file as you code that need to call it, it can be called. set from the top-left corner of FServiceMnuRect (A member variable of TForm1). the bounding rectangle of a given window. handler. This drawing rectangle is where the menu item is really drawn. the event handler and restore it after. My blog post about using pipes for inter-process communication has a lot of interest. It has been updated by Arno Garrels from DuoData Software. Arno added 64-bit support and fixed code to compile with Delphi 7 to XE5 (earlier versions may compile however untested). The original blog post is here. The link to the source code in the article point to the updated code. CodeRage 8 is just around the corner on October 15th through 17th. This online event is completely free and full of technical sessions all about Delphi XE5 and mobile development. ICS which exists since 1996, has been released in his version 8. V8 was at beta stage for about one year. Now it is released! The new ICS-V8 is for Delphi 7 / C++ Builder 2006 to Delphi XE5 / C++ Builder XE3 with FireMonkey cross platform support for POSIX/MacOS, also IPv6 support (main development tree, 32 and 64-bit). Note that latest C++ Builder version supported is XE3 (lack of spare time, sorry). If you use the SVN repository, you will get the V8 automatically since it has been merged to the trunk. Look at the readme: http://svn.overbyte.be:8443/svn/ics/trunk/ReadMe8.txt (User code and password are both "ics"). If you need help please don't ask thru this blog, but use the support mailing list. I will NOT answer to questions posted as comment to this blog post. If you don't know the mailing list, just go to the support page at http://www.overbyte.be. By the way, there is a ICS-V9 in preparation. It will support Android. Stay tuned! Windows is having some trouble with very long path environment variable, even in Windows 7. There are several limits which prevent the path to be as long as one would like. This present an issue when you have installed a bunch of software, each one adding is own items to the path variable. A some point, the path becomes too long and strange things happens such as control panel applet not working anymore. This happened to me when installing Delphi XE5 on a system which already had a lot of software, including 6 other Delphi versions. Change the shortcut (Desktop and Start Menu) to run your batch instead of the application. PATH | FIND /I "%RSBIN%"
Please note that the paths in this batch reflect my own installation: Delphi is on D: driver and common files on C: drive. You must adapt this to your own setup! The batch is almost the same for X2, XE3, XE4 and XE5. Just change the version number form 12.0 for XE5 down to 9.0 for XE2. Before XE2, the batch is a little bit different because there was no win64 compiler. The arts with win64 and bin64 must be removed. At some point in the past, Embarcadero directory was CodeGear and even before it was Borland. The executable file is bds.exe for most versions, but it was Delphi32.exe for Delphi 7 and earlier. All in all, just have a look at your path variable and reproduce what you see.